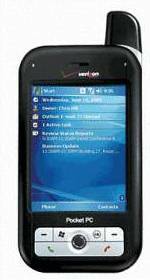 Verizon UTStarcom XV6700 operates on Windows Mobile 5.0 with Mobile Office suite and has EV-DO, WiFi, Bluetooth, 64MB of RAM, 128MB of flash ROM, a miniSD memory card slot, a 1.3 megapixel digital camera, a 416MHz processor, a 2.8-inch, 320 x 240 LCD display, and a slide-out QWERTY keyboard. Top Tech News reviewed Verizon XV6700 and concluded that Verizon’s new smartphone offers good looks with great business features, but a lack of some connectivity options knocks the XV6700 down a few pegs. Business road warriors can find better options in the super-popular Palm Treo 700w. The rating for the UTStarcom XV6700 is 3.5 out of 5. Pros: Attractive design; latest Microsoft mobile software; plethora of wireless options; good battery life. Cons: Not designed to double as a wireless modem for laptops; phone must be turned off to use integrated Wi-Fi radio.